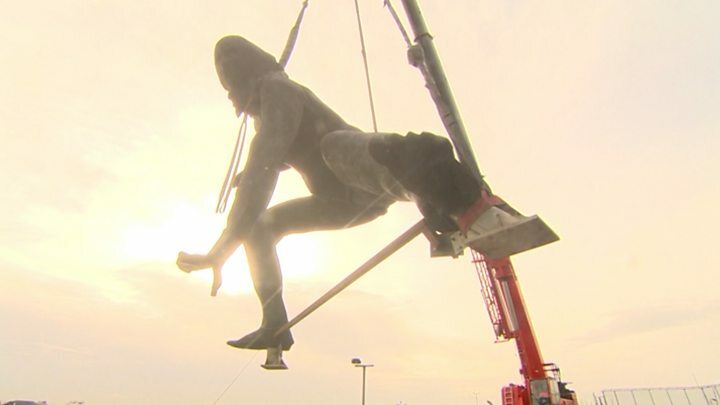 The sculpture's name refers to the "pivotal" role of a performer to "breathe life into words", he added. The theatre said: "We wanted to do something bold that reflected the creativity that is at the heart of the Theatre Royal. "It will create a unique landmark for the city and strengthen its cultural offering. "In time, it may become one of those iconic statues that destinations become forever associated with." When it is in place, visitors will be able to walk between Messenger's legs "into the theatre, like an archway". The Theatre Royal said it was "by far" the UK's largest bronze sculpture by volume, at 25.6 cubic metres.